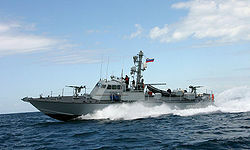 The Israeli Navy (Hebrew: חיל הים הישראלי‎, Ḥeil HaYam HaYisraeli (English: Sea Corps of Israel); Arabic: البحرية الإسرائيلية‎) is the naval warfare service arm of the Israel Defense Forces, operating primarily in the Mediterranean Sea theater as well as the Gulf of Aqaba and the Red Sea theater. The current commander in chief of the Israeli Navy is Aluf Eli Sharvit. The Israeli Navy is believed to be responsible for maintaining Israel's offshore nuclear second strike capability. In 1938, encouraged by the Jewish Agency, Dr. Shlomo Bardin founded the Marine High School in Bosmat, the Technion's Junior Technical College. 1943 witnessed the founding of the Palyam, the naval branch of the Palmach, whose training was undertaken at the maritime school. The Jewish merchant marine was also raised, operating SS Tel-Aviv and cargo ships such as Atid. Palyam members who had led the clandestine and immigration effort, but had no sea background in navigation or leading a ship into a battle. The captains of clandestine and immigration ships were Italian, while Palyam personnel were commanding the ship under instructions from the Haganah. Ike Aharonowitch, captain of Exodus and a Jew, was the exception rather than the rule. Jewish volunteers from the United States Navy and Royal Navy, such as Commander Paul Shulman of the U.S. Navy, and Commanders Solomon and Allen Burk of the Royal Navy. These, however, were often discriminated against and their experience wasted by a navy command that was based on the Palmach and its various branches. This resulted in odd situations where unskilled officers from the Palyam were in command of far more experienced naval officers. During the war, the warships served on coastal patrol duties and bombarded Arab targets on land, including Egyptian coastal installations in and around the Gaza area all the way to Port Said. The Israeli Navy also engaged the Egyptian Navy at sea during Operation Yoav, and the Egyptian Navy's flagship, Emir Farouk, was sunk in an operation by Israeli naval commandos. To make matters worse, Palyam personnel often resisted efforts to instill order, discipline and rank in the newly formed service. Mess rooms were initially shared by both officers and enlisted men. Ships possessed a captain with nautical skills, but also a commanding officer regarded as political. This would cause a great deal of debate between veterans of the Palyam, Royal Navy volunteers from the Haganah and U.S. Navy Machal volunteers about what form the Navy should take. Commander Allen Burk is reputed to have said, out of despair, "You cannot make naval officers from cowboys". 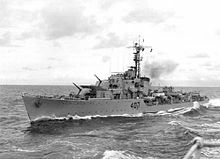 Royal Navy Captain Ashe Lincoln, who was Jewish, advised Prime Minister David Ben-Gurion to purchase corvettes, frigates, destroyers, torpedo boats, and patrol boats to build up the Israeli Navy power. For that sake he urged Ben-Gurion to consult with professional navy advisers. This resulted in instructions to contact U.S. Navy advisors, mainly Commander Paul Shulman from the U.S. Navy. In the most significant engagement in its history, during the Yom Kippur War five Israeli Navy missile boats sank five Syrian ships without losses during the Battle of Latakia. As a result, the Syrian Navy remained in port for the remainder of the conflict. It was the first naval battle in history between surface-to-surface missile-equipped missile boats. 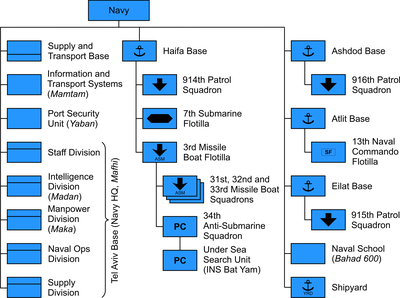 Another significant engagement is the Battle of Baltim, during which six Israeli Navy missile boats engaged four Egyptian Navy missile boats sinking three, again, without losses. Based in Haifa, Eilat, and Ashdod respectively, Squadrons 914, 915, and 916 defend Israel's shores from nearby. 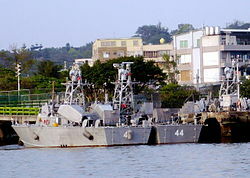 The Missile Boats Flotilla, based at Haifa. It consists of the 31st, 32nd and 33rd Missile Boat Squadrons and the 34th Anti-Submarine Squadron. Fire support for ground units. The Submarine Flotilla, a volunteer unit founded in 1959. Deployment and recovery of Shayetet 13 naval commandos. For security reasons, applicants with dual citizenship must now officially renounce all other citizenships to be accepted into the submarine service training program. Force protection and harbour security unit. Also in charge of diving checkups of civilian ships entering Israeli harbours. The contract for the sixth and final Dolphin-class submarine is expected to be operational by 2017. ThyssenKrupp will also build four Sa'ar patrol vessels for EEZ duties such as protecting offshore gas fields. The ships will be based on the MEKO A-100 design like Germany's Braunschweig-class corvettes, suggesting they will be 90 m (295 ft) long and displace around 1,800 tonnes, named Sa'ar 6-class corvette. This deal was signed in December 2014 and Germany is believed to be contributing up to €115m of the €1 billion cost. 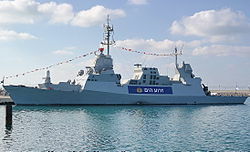 Previously Israel had hoped to acquire an up-armed version of the Freedom class of littoral combat ships from Lockheed Martin, but spiralling costs had made this impossible, along with a fallback option from Northrop Grumman/Huntington Ingalls Industries which built the Sa'ar 5 class. ^ Cirincione, Joseph; Wolfsthal, Jon B.; Rajkumar, Miriam (2005). Deadly arsenals: nuclear, biological, and chemical threats. Carnegie Endowment. pp. 263–4. ^ a b c d "Anat Kidron MA Thesis, Israeli Navy Year of Foundation". Haifa University Israel. October 2000. Archived from the original on 20 December 2008. Retrieved 2 December 2009. ^ a b "The last Battle of the Destroyer INS Eilat by Commander Yitzhak Shushan". Ma’ariv Publishing House. 1993. Retrieved 2 December 2009. ^ "MACHAL Overseas Volunteers In Israel's War of Independence Page 28" (PDF). MOD IDF. 2007. Retrieved 2 December 2009. ^ "A Tiny, but Hard-Hitting Battle Force". By David Hanovice North American Volunteers In Israel's War of Independence. 2007. Retrieved 5 December 2009. ^ "Paul Schulman". NY Times. 18 May 1994. Retrieved 2 December 2009. ^ Nadav Reis. "Known Decorations for Bravery Awarded to Machalniks who served in World War II - מח"ל עולמי". Retrieved 29 June 2015. ^ "The last Battle of the Destroyer INS Eilat by Commander Yitzhak Shushan". Ma'ariv Publishing House. 1993. Retrieved 2 December 2009. ^ Commander Shlomo, Ya'akobson a Hagana Veteran of the Royal Navy (1997). "Betaltala". MOD House. Retrieved 5 December 2009. ^ "Ashe Lincoln". Dangoor.com. Retrieved 4 March 2017. ^ "The Missile Boat War The 1973 Arab-Israeli War at Sea" (PDF). By Dave Schueler. 2009. Archived from the original (PDF) on 27 October 2009. Retrieved 3 December 2009. ^ "The Battle of Latakia". Jewish Virtual Library. ^ "IDF Ranks". IDF Spoke Man. 2009. Archived from the original on 30 August 2009. Retrieved 3 December 2009. ^ "Israel seeks sixth Dolphin in light of Iranian 'threat'". Janes.com. 1 October 2009. Retrieved 1 June 2010. 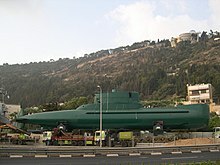 ^ "IDF submarine fleet bans dual citizenship". ynet. Retrieved 29 June 2015. ^ "Ship Naming in the United States Navy". About.com. Archived from the original on 21 August 2014. Retrieved 21 August 2014. ^ a b John Pike. 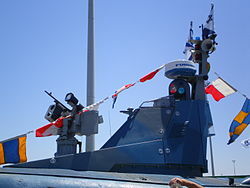 "Navy Equipment - Israel". Retrieved 29 June 2015. ^ The Military Balance 2017, International Institute for Strategic Studies, 14 February 2017, p. 384 . ^ "חדשות - צבא וביטחון nrg - ...נושאת מזל"טים: חיל הים כובש". Retrieved 29 June 2015. 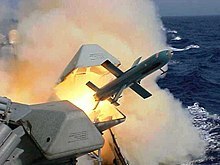 ^ "IAI seeks foreign investors to develop new missile warship". Archived from the original on 1 July 2015. Retrieved 29 June 2015. ^ a b Opall-Rome, Barbara (25 December 2014). "Israel, Germany Seal Offshore Patrol Vessel Deal". Defense News. ^ Hudson, Alexandra (15 December 2015). "Germany says will help finance four new Israeli warships". Reuters. ^ "Israel Navy Commanders-in-Chief". Jewishvirtuallibrary.org. Retrieved 30 July 2016. This page was last edited on 13 March 2019, at 01:09 (UTC).